Warning: there are some pictures and words that qualify as "Not Safe For Work" in this post (blue language). Well, not safe for some work places. They are obviously safe for mine, since this week I'm writing about how I have my office decorated. You see, when I got my first professional position, I played it super safe with decorating my office. No toys to speak of, posters that anyone anywhere would post, and nothing of consequence (other than my name plate) on my door. My current office couldn't be more different. I can always tell when someone hasn't been in my work abode before, even if I don't remember. Eyes get big. Sometimes mouths drop open. It's so much fun to watch people who have never been in here before. 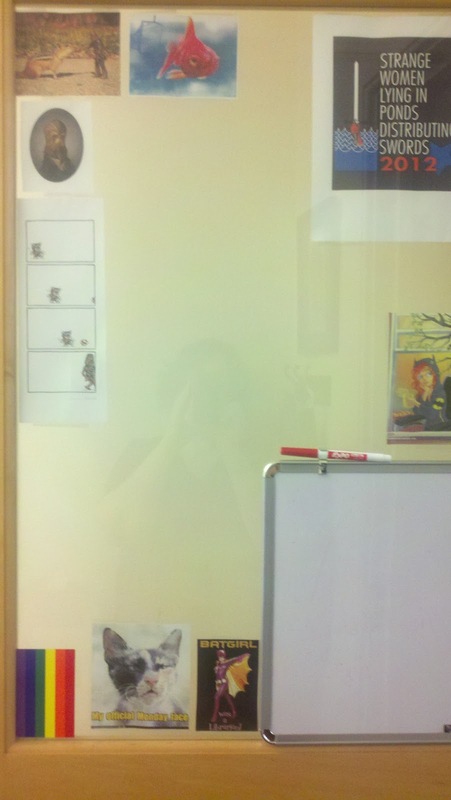 As you can see from the pictures below, there's a lot to look at in my office. Truth is, there's plenty more that I haven't shown you, but I figured this would be enough to give you an idea. 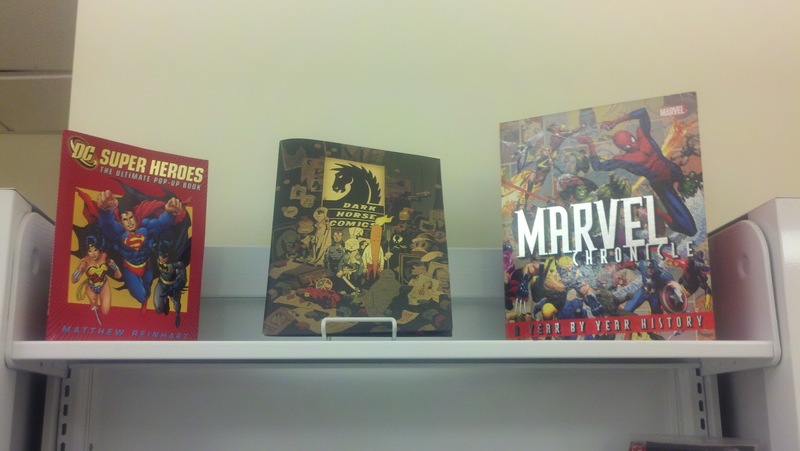 You see, my office really does reflect me and my personality. As I've said before, and as I'll probably say again, letting my personality show (read: letting my nerd flag fly) enhances my relationship with my community. Yes, you do see multiple representations of Chewbacca. And of Barbara Gordon. Pride of place (middle slot) goes to my favorite comic publisher. So, why am I sharing this with you? Other than showing off my rad collection, I mean. I'm sharing it to once again exhort you to be yourself. I work in a place where I'm not only allowed to be myself, I'm valued for who I am. You don't have to be as extreme in your decoration. 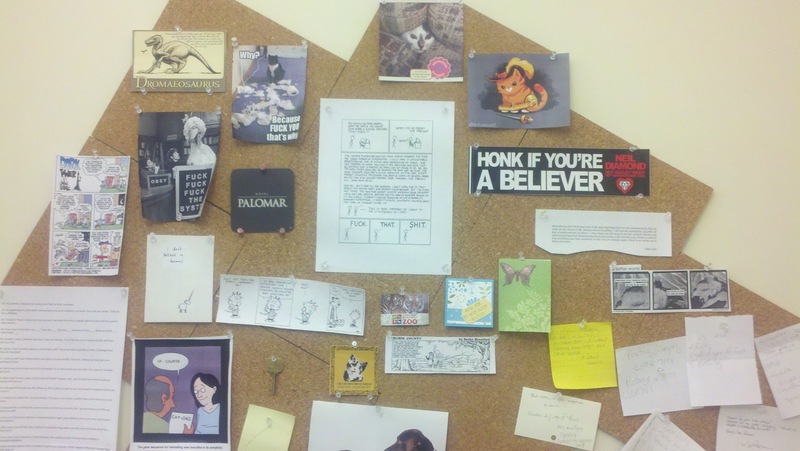 After all, I have posted six instances the f-bomb, or derivations thereof: three on this picture, one on this, one in this comic, and then the lovely bumper sticker that was a gift of a member of our communication department. And that's what I wish for you. Even if you don't have it now, I hope you eventually get to work in a place that doesn't just value your librarian skills, that values you as a whole person. 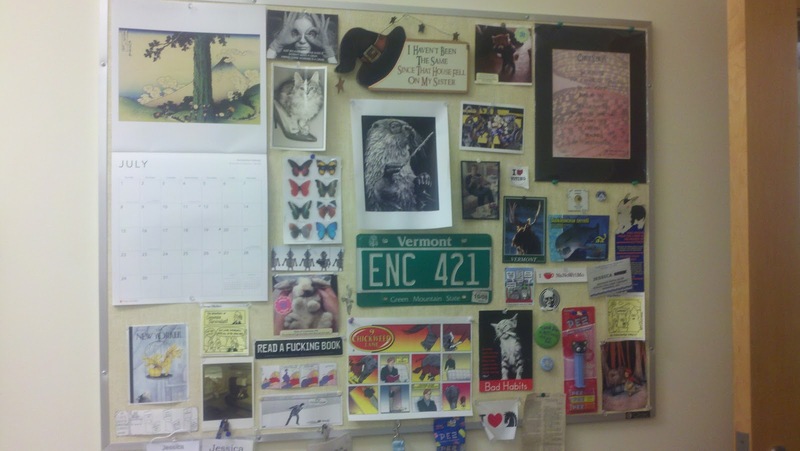 For those of you who have an office (or cubicle), what kinds of stuff do you have in there? Toys? Posters from a fantastic concert? Pictures of your pet ferret? 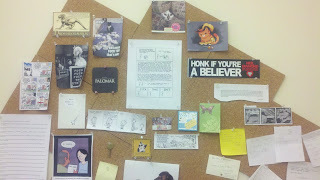 When I had only a cubicle I still had my stuff up. Fortunately I shared an office with someone who had fab taste so the art she'd already put up was great, too. I have a desk in a nook, so not as much space as I'd like for making it my own. BUT, I do have a Belle Pez dispenser and a Batman Beyond action figure on my desk, a Valentine from my gent, a change box that says "I'm saving up for a new tattoo! ", and a pair of dorky mugs: one has Marvel ladies on it and is for drinking tea, the other has the TARDIS on it and is for holding pens (it no longer has a handle). I think personalizing your office space is really important. It helps a person to not feel so much like a drone or cog. 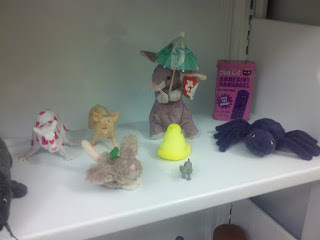 One reason I feel kindly toward my company is that they really let employees let loose with cube decor--walking around the building I've seen paper parasols, tons of plants, action figures and dolls, art of all kinds. Makes the stretches of cubicles and offices less monotonous and more like actual people work here. Exactly - beyond the connections I can make with my community (see the comment below from Amber) having my office this way makes it feel more welcoming. I love your office! It gives me such joy to stop by for a visit - I always find something new. I love coming to your office, too, but that's more because of your puppalicious office mate than anything you've put in there. As for the other stuff... yeah. I can see that as a consideration. In that kind of situation I might take down a couple of the F bombs. Heh. My office needs serious help. It looks like a temp works here and that is not the impression I'm trying to make! Everyone else has photos of their kids or pets, but I don't have any kids or pets, so it's just a calendar, an African violet, some statistics textbooks, and a stuffed owl right now. Sad. All of my corgi paraphernalia has moved from home to decorate my office. I have a cute mug, two small pieces of art, and a calendar with corgis. I also have a nice crocheted blanket for cold days, a stuffed microbe, a few reference texts, and some inexpensive wall decals from Ikea. And a pile of fiction books 'liberated' from our unsuccessful book sale. They will make their way home once I've finished moving into my new place.